I have not looked at oil production time series for North Dakota in a while so I thought it time to take a look. Oil production, in fact most commodity production, and certainly extractive production, has an interesting cost structure. There are significant fixed cost elements to cover in order to generate profit. 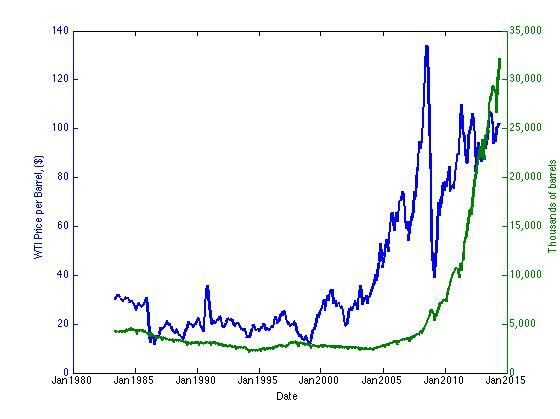 Notice in the graph below that while price starts rising around 2000, it was not until around 2005 that production started to rise. As the price continues to rise we see production continue to increase too. What will be interesting to see is what happens when prices fall. Rigs are sunk costs, literally. When there is a decrease in price, as long as price covers the pumping costs it remains profitable to extract oil, at least over the short run. 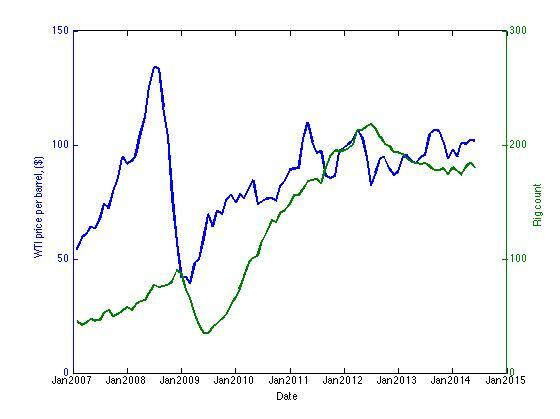 Price and the rig count from the Bakken formation tell a story similar to the graph above. Here when the price dropped rig count went down a bit, but this is hardly a great test. A more sustained decline in prices would let us know more about firm behavior, though the more consistent level of prices since 2011 coincides with a flatter portion of the rig count too. There is obviously some potential correlation between these issues, for example prices and infrastructure. I am often asked what I look at when thinking about oil and the North Dakota economy. These are some of my factors. The transportation of oil is a key issue and could potentially reduce the need for other types of regulation for the industry. The last piece, prices, is of course a big issue too. Ongoing investment needs prices to stay higher, but again that does not mean the industry stops altogether. All signs seem to indicate oil will continue to be a big part of North Dakota economic growth and development, at least as long as no issues arise.